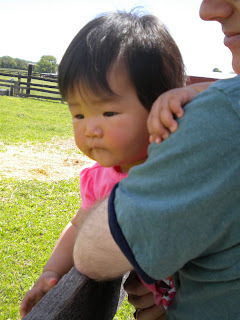 We had a beautiful weekend here in Northern Virginia, so Saturday we all went to Frying Pan Park. Frying Pan is a demonstration farm, and Hannah loved the opportunity to say hello to all of the new baby animals. Her favorites were the baby cows and the baby chicks! Well, that and the other kids - she REALLY loved looking at the other kids, especially the ones who were feeding the baby cows out of their hands! She also got to go to her first playground. She wasn't too sure about the slide, but she would giggle each time she got to the bottom! Monday we had lunch with our new friend Clara. 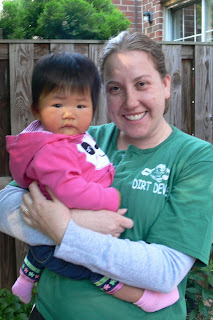 Clara was adopted from China a week after Hannah. Mara has become close with Clara's mother (along with a couple of other girls) over the course of the wait, and it was wonderful to go out with our girls in tow (and we just need the last of the April referrals to arrive so that ALL of our April friends will have their munchkins the next time we play!). 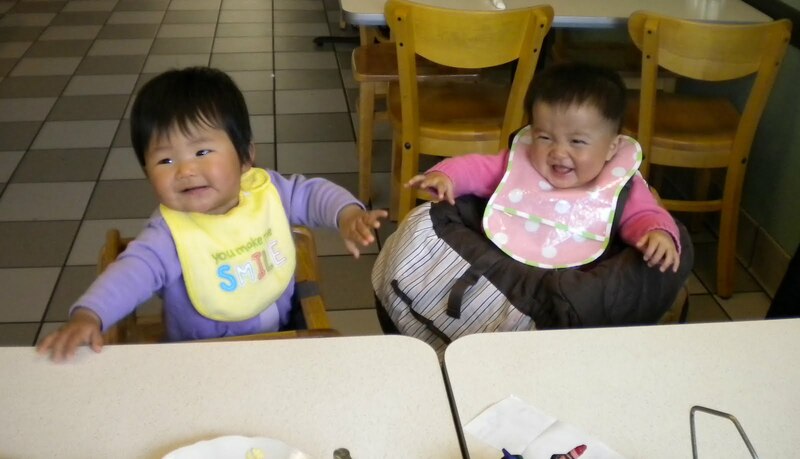 The girls were so cute together - they liked talking and holding hands as we ate. It's hard to believe that one month ago we were in China, just having met Hannah. It's still sort of surreal - even after a month, it's hard to believe sometimes that she is all ours. It's amazing to look at the pictures from a month ago and realize just how far she has come in a month. When we got her, she couldn't sit up on her own, couldn't feed herself, couldn't reach her own toes, and couldn't fall asleep unless we sang to her and sat with her. Today she can sit up on her own - in fact, she is sitting up and enjoying Sesame Street with us right now (no real surprise that she loves it, considering how much Mommy & Daddy love Sesame Street, or that she is fascinated by Cookie Monster, considering how she eats!). She can also roll anywhere she wants (and VERY quickly...Mommy looked down for a moment yesterday and all of a sudden Hannah was under the dining room table! 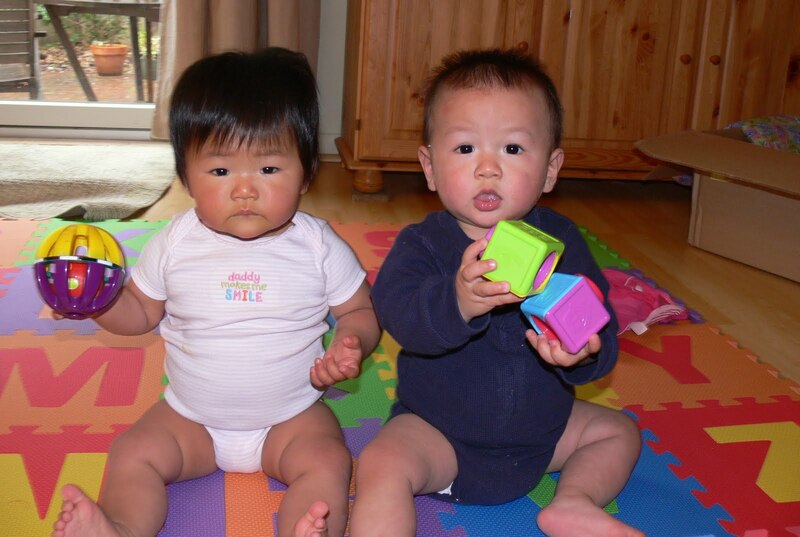 ), and is very close to crawling - she gets herself up on one knee and rocks back and forth. Hannah still loves food, and can now feed herself (and is getting much better with the accuracy - she likes to grab food and just smush it against her face!). She is getting better with the sleeping, and likes to listen to her CDs while she talks to her taggie blanket as she falls asleep. She amazes us every day. She's also quite a trooper. It's a huge transition for her, and she is handling it really well. She spent the first 9 months of her life with no real home...she was brought to the police station when she was first found, then at the orphanage for a few months, then in foster care (and perhaps in several foster homes - we don't know anything from this time), then back in the orphanage, then with us in two different hotels, then finally home. All the travel was hard on us as adults - it's amazing how well she is doing with all of the changes. We've been trying to keep a consistent schedule and keep our activities as "boring" as possible. The International Adoption doctor (who was fantastic) told us to try to limit ourselves to one outing/visitor a day for the next few months. And she's not too cranky about all of the doctor's appointments and bloodwork. (but please don't tell her that we've got three more this week!) Thankfully, the waiting room at the International Adoption Clinic (part of the Children's Hospital Specialty Center - a really great place!) 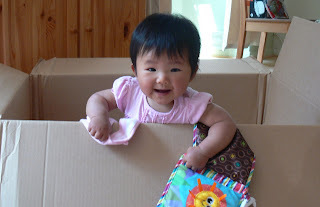 has phenomenal toys (check out the cool wooden thing Hannah played with this past week!). And even though I have been horrible about taking pictures, Hannah has LOVED her playdates with all of her new friends! Thank you for all of the kind words/emails/notes. I know I have not been great about replying to anyone in a timely fashion. With 540 new emails in my inbox (yes, seriously), it's taking me awhile. :) Oh yeah - we're still looking for the sender of the Red Sox Mrs. Potato Head...did you send it? Please email Mara - it arrived with no note, packing slip, or even a return address!